So the point of this rather odd little sketch made completely out of my head, is to ask a question: Who is he? There’s this man, who stands on the side of Sedge Garden Rd. near the intersection with Kernersville Rd. He’s there every morning when I take Maddie to school. He’s there every afternoon when she needs to be picked up from after school activities. I began to notice him last Spring. And I’ve seen him there ever since. He is always holding something up to his mouth or ear that looks like an old cell phone. He’s often talking into it. Sometimes, he has a pipe also. My sketch, all wonky and out of scale, seems to show him looming on the sideline. He actually blends into the wintry surroundings with his woodsy coat and hat. I wonder if others notice him at all. My imagination takes hold of me…is he an undercover agent recording the comings and goings of a particular person? Is he a granddad who watches his grandkids walk to school and back while talking on the phone with a friend? 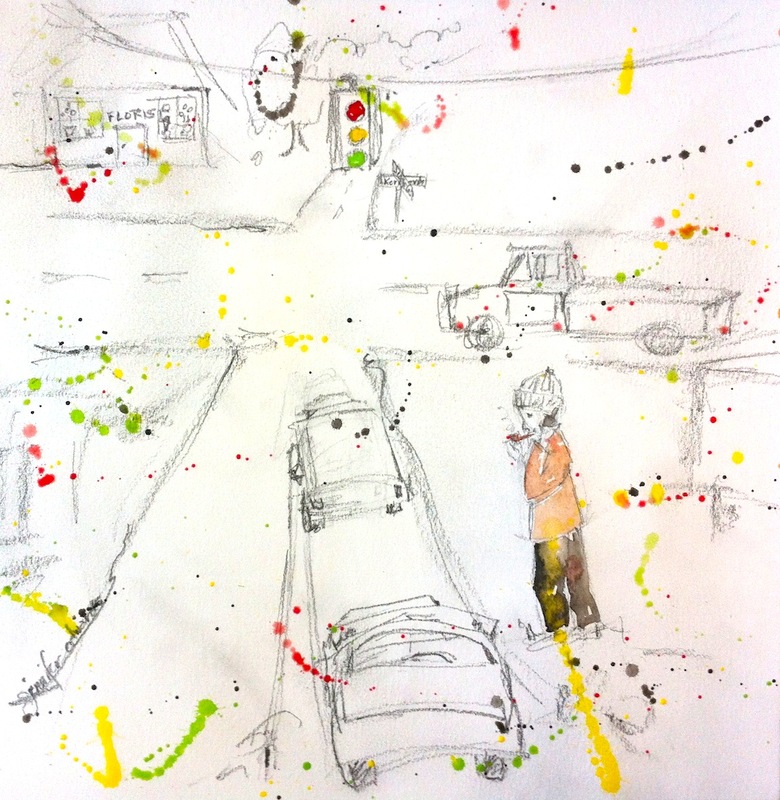 Is he a writer recording the daily events of cars and passersby at a single intersection? Will my white Mazda 5 wind up in a short story or novel someday? Is he, as my husband suggests, simply listening to a CB radio? Does he live in the side-of-the-road trailers and this is his “front porch”? Does he need to come outside in order for his cell phone to have any reception? No matter the season, no matter the weather, this guy is there. There’s a part of me that wants to stop and ask him kindly someday what he’s up to. To know his story. To discover the character behind the mystery. But then again, part of me doesn’t. The wondering about it all is just too fun! Do you have mystery people like this in your neighborhood or town? Kernersville seems to have quite a few. I wrote about (and drew) this guy several years ago. I did actually stop and ask him if I could take his photograph, to which he replied, “Five dollah, five dollah!” So I paid him the $5 and got a few good reference pics for the drawings. There’s also a dancing man at the corner of one of our major intersections. He isn’t so much a mystery (since he’s gotten a good bit of press:) but he’s certainly a character we consider to be Kernersville’s own. All these folks make small town living interesting and delightful. I’m a people watcher from way back and I’m always curious about people with a sense of mystery too. I’m glad I’m not the only one who imagines all sorts of scenarios. lol Cool sketch! Good to know a fellow imagination! 🙂 Thanks for visiting Serena! Great story. It’s almost more fun not knowing then you can continue to let your imagination soar. I agree! Thanks for taking the time to read and comment Rebecca! He looks pretty solid to me, and wears clothing suitable to the weather. Would ghosts need that? 😉 Haha! Thanks for stopping by! Yes! I do think they add interest to our days! Thanks for visiting and commenting Agata!! We had an old man sitting in a jeep for years at a crossroads, always wondered why, then one day he wasn’t there anymore. Perhaps they are just waiting for someone that never arrives? Oh I love this Cathy. Sometimes I feel like I want to listen to and tell their story…to somehow uphold them as human beings, whatever their life story. Thank you for your comment.